Plug and play, 3.5mm audio jack, no Bluetooth pairing, no waiting, unique line-in "wireless" concept. 1. Short press on the power key. If the blue indicator light is steady on, that means the speaker enter into energy saving mode. If there is no any audio input signal in 5 minutes, it will automatically turn off. 2. Long press on the power key. If the blue indicator light is steady on after flashing for several times, that means the speaker is power on and will not turn off automatically. 3. 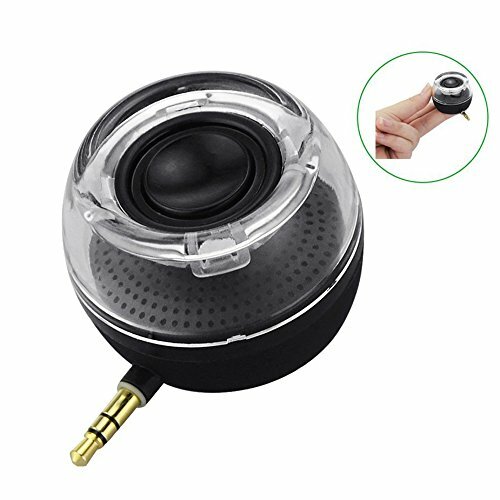 Plug the speaker into player device. 4. During playing time, adjust the volume key of your player device to control the speaker's volume. ✔ MINI BODY & MULTI FUNCTION: Brand new design with a compact body to let you go anywhere with it; Small size and light weight to carry, you could put it in pocket, bag, brief case etc. It is potential to interact with a lot of smartphon apps: Video Games, Music, Movies, Hands-free calls, GPS voice navigation, sleep therapy apps, etc.. It is really a perfect accessory for smartphone.